Heat oven to 325°F. Grease and flour 12-cup bundt cake pan, or spray with baking spray with flour. In small bowl, beat 6 oz cream cheese with electric mixer on medium speed until smooth and fluffy. Beat in granulated sugar, 1 tablespoon flour and 1 egg until smooth; set aside. In large bowl, beat cake mix, 1/4 cup flour, the water, oil and 2 eggs with electric mixer on medium speed 2 minutes; stir in 1/2 cup chocolate chips. Pour into pan. Spoon cream cheese filling over batter, keeping it away from edge of pan. Run table knife through batter in large zigzag pattern once around pan. Bake 40 to 45 minutes or until toothpick inserted in center of cake comes out clean. Cool in pan 10 minutes. Turn pan upside down onto cooling rack; remove pan. Cool completely, about 1 hour. In small bowl, beat 2 oz cream cheese and 2 teaspoons milk using whisk. Beat in icing sugar until smooth. If too thick, add additional milk, 1 teaspoon at a time, until desired consistency. Spoon icing over cake. In small microwavable bowl, microwave whipping cream uncovered on High 30 seconds or until cream just beings to simmer. Add 1/2 cup mini chocolate chips; stir until smooth. Place in small resealable food-storage plastic bag. Cut off small corner of bag; drizzle over white icing. 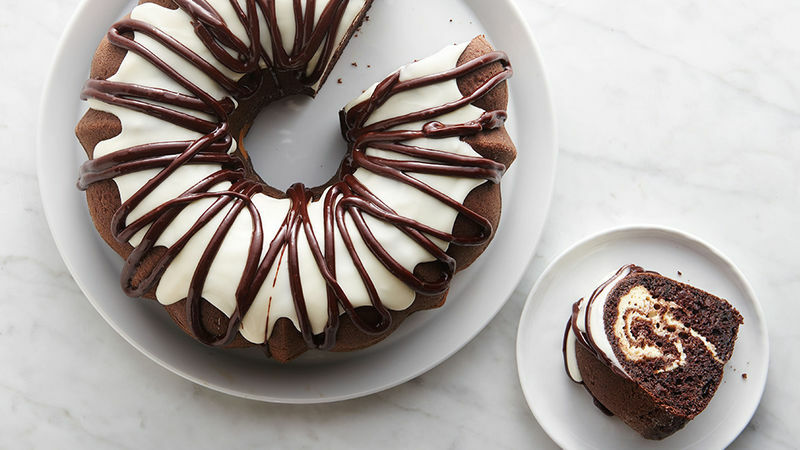 If you want a solid cream cheese filling, you don’t have to swirl it. Make sure your cream cheese is well softened to blend well. Unwrap and microwave 15 to 20 seconds on High to soften.